A nuclear-powered aircraft is a concept for an aircraft intended to be powered by nuclear energy. The intention was to produce a jet engine that would heat compressed air with heat from fission, instead of heat from burning fuel. During the Cold War, the United States and Soviet Union researched nuclear-powered bomber aircraft, the greater endurance of which could enhance nuclear deterrence, but neither country created any such operational aircraft. 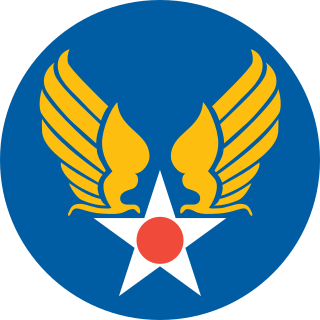 The United States Army Air Forces, informally known as the Air Force,or United States Army Air Force, was the aerial warfare service of the United States during and immediately after World War II (1939/41–1945), successor to the previous United States Army Air Corps and the direct predecessor of the United States Air Force of today, one of the five uniformed military services. The AAF was a component of the United States Army, which in 1942 was divided functionally by executive order into three autonomous forces: the Army Ground Forces, the Services of Supply, and the Army Air Forces. Each of these forces had a commanding general who reported directly to the Army Chief of Staff. The United States Atomic Energy Commission, commonly known as the AEC, was an agency of the United States government established after World War II by U.S. Congress to foster and control the peacetime development of atomic science and technology. President Harry S. Truman signed the McMahon/Atomic Energy Act on August 1, 1946, transferring the control of atomic energy from military to civilian hands, effective on January 1, 1947. This shift gave the members of the AEC complete control of the plants, laboratories, equipment, and personnel assembled during the war to produce the atomic bomb. Direct cycle nuclear engines would resemble a conventional jet engine, except that there would be no combustion chambers. The air gained from the compressor section would be sent to a plenum that directs the air into the nuclear reactor core. An exchange takes place where the reactor is cooled, but it then heats up the same air and sends it to another plenum. The second plenum directs the air into a turbine, which sends it out the exhaust. The end result is that instead of using jet fuel, an aircraft could rely on the heat from nuclear reactions for power. A combustion chamber is that part of an internal combustion engine (ICE) or a reaction engine in which the fuel/air mix is burned. A plenum chamber is a pressurised housing containing a gas or fluid at positive pressure. One function of the plenum is to equalise pressure for more even distribution, because of irregular supply or demand. A plenum chamber can also work as an acoustic silencer device. The General Electric program, which was based at Evendale, Ohio, was pursued because of its advantages in simplicity, reliability, suitability and quick start ability. Conventional jet engine compressor and turbine sections were used, with the compressed air run through the reactor to be heated by it before being exhausted through the turbine. Evendale is a village in Hamilton County, Ohio, United States. The population was 2,767 at the 2010 census. A jet engine is a type of reaction engine discharging a fast-moving jet that generates thrust by jet propulsion. This broad definition includes airbreathing jet engines. In general, jet engines are combustion engines. A turbine is a rotary mechanical device that extracts energy from a fluid flow and converts it into useful work. The work produced by a turbine can be used for generating electrical power when combined with a generator. A turbine is a turbomachine with at least one moving part called a rotor assembly, which is a shaft or drum with blades attached. Moving fluid acts on the blades so that they move and impart rotational energy to the rotor. Early turbine examples are windmills and waterwheels. The United States Aircraft Reactor Experiment (ARE) was a 2.5 MW thermal nuclear reactor experiment designed to attain a high power density for use as an engine in a nuclear-powered bomber. It used the molten fluoride salt NaF-ZrF4-UF4 (53-41-6 mol%) as fuel, was moderated by beryllium oxide (BeO), used liquid sodium as a secondary coolant and had a peak temperature of 860 °C. It operated for a 1000-hour cycle in 1954. It was the first molten salt reactor. Work on this project in the United States stopped after intercontinental ballistic missiles made it obsolete. The designs for its engines can currently be viewed at the Experimental Breeder Reactor I memorial building at the Idaho National Laboratory. A thermal-neutron reactor is a nuclear reactor that uses slow or thermal neutrons. A nuclear reactor, formerly known as an atomic pile, is a device used to initiate and control a self-sustained nuclear chain reaction. Nuclear reactors are used at nuclear power plants for electricity generation and in propulsion of ships. Heat from nuclear fission is passed to a working fluid, which in turn runs through steam turbines. These either drive a ship's propellers or turn electrical generators' shafts. Nuclear generated steam in principle can be used for industrial process heat or for district heating. 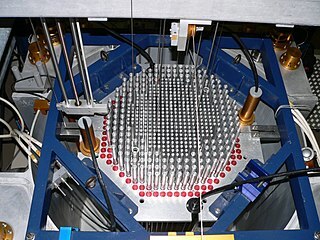 Some reactors are used to produce isotopes for medical and industrial use, or for production of weapons-grade plutonium. Some are run only for research. As of early 2019, the IAEA reports there are 454 nuclear power reactors and 226 nuclear research reactors in operation around the world. Power density is the amount of power per unit volume. In 1955, this program produced the successful X-39 engine, two modified General Electric J47s, with heat supplied by the Heat Transfer Reactor Experiment-1 (HTRE-1). The first full power test of the HTRE-1 system on nuclear power only took place in January 1956. A total of 5004 megawatt-hours of operation was completed during the test program. The HTRE-1 was replaced by the HTRE-2 and eventually the HTRE-3 unit powering the two J47s. The HTRE-3 used "a flight-type shield system" and would probably have gone on to power the X-6 had that program been pursued. The General Electric J47 turbojet was developed by General Electric from its earlier J35. It first flew in May 1948. The J47 was the first axial-flow turbojet approved for commercial use in the United States. It was used in many types of aircraft, and more than 30,000 were manufactured before production ceased in 1956. It saw continued service in the US military until 1978. Packard built 3,025 of the engines under license. Indirect cycling involves thermal exchange outside of the core with compressor air being sent to a heat exchanger. The nuclear reactor core would heat up pressurized water or liquid metal and send it to the heat exchanger as well. That hot liquid would be cooled by the air; the air would be heated by the liquid and sent to the turbine. The turbine would send the air out the exhaust, providing thrust. On September 5, 1951, the USAF awarded Convair a contract to fly a nuclear reactor on board a modified Convair B-36 Peacemaker  under the MX-1589 project of the ANP program. The NB-36H Nuclear Test Aircraft (NTA) was to study shielding requirements for an airborne reactor, to determine whether a nuclear aircraft was feasible. This was the only known airborne reactor experiment by the U.S. with an operational nuclear reactor on board. The NTA flew a total of 47 times testing the reactor over West Texas and Southern New Mexico. The reactor, named the Aircraft Shield Test Reactor (ASTR), was operational but did not power the aircraft, rather the primary purpose of the flight program was shield testing. Based on the results of the NTA, the X-6 and the entire nuclear aircraft program was abandoned in 1961. A nuclear thermal rocket is a proposed spacecraft propulsion technology. In a nuclear thermal rocket a working fluid, usually liquid hydrogen, is heated to a high temperature in a nuclear reactor, and then expands through a rocket nozzle to create thrust. This kind of thermal rocket, the nuclear reactor's energy replaces the chemical energy of the propellant's reactive chemicals in a chemical rocket. The thermal heater / inert propellant paradigm as opposed to the reactive propellants of chemical rockets turns out to produce a superior effective exhaust velocity, and therefore a superior propulsive efficiency, with specific impulses on the order of twice that of chemical engines. The overall gross lift-off mass of a nuclear rocket is about half that of a chemical rocket, and hence when used as an upper stage it roughly doubles or triples the payload carried to orbit. In a Nuclear Electric Rocket, nuclear thermal energy is changed into electrical energy that is used to power one of the electrical propulsion technologies. Technically the powerplant is nuclear, not the propulsion system, but the terminology is standard. A number of heat-to-electricity schemes have been proposed: Rankine cycle, Brayton cycle, Stirling cycle, thermoelectric, pyroelectric, thermophotovoltaic, thermionic and magnetohydrodynamic type thermoelectric materials. Pratt & Whitney is an American aerospace manufacturer with global service operations. It is a subsidiary of United Technologies (UTC). Pratt & Whitney's aircraft engines are widely used in both civil aviation and military aviation. Its headquarters are in East Hartford, Connecticut. As one of the "big three" aero-engine manufacturers, it competes with General Electric and Rolls-Royce, although it has also formed joint ventures with both of these companies. In addition to aircraft engines, Pratt & Whitney manufactures gas turbines for industrial and power generation, and marine turbines. As of 2014, the company reported having 31,500 employees supporting more than 11,000 customers in 180 countries around the world. In 2013, Pratt & Whitney's revenue totaled $14.5 billion. Project Pluto was a United States government program to develop nuclear-powered ramjet engines for use in cruise missiles. Two experimental engines were tested at the United States Department of Energy Nevada Test Site (NTS) in 1961 and 1964. Nuclear propulsion includes a wide variety of propulsion methods that fulfill the promise of the Atomic Age by using some form of nuclear reaction as their primary power source. The idea of using nuclear material for propulsion dates back to the beginning of the 20th century. In 1903 it was hypothesised that radioactive material, radium, might be a suitable fuel for engines to propel cars, boats, and planes. H. G. Wells picked up this idea in his 1914 fiction work The World Set Free. The Pratt & Whitney J58 was a jet engine that powered the Lockheed A-12, and subsequently the YF-12 and the SR-71 aircraft. It was an afterburning turbojet with a unique compressor bleed to the afterburner which gave increased thrust at high speeds. Because of the wide speed range of the aircraft the engine needed two modes of operation to take it from stationary on the ground to 2,000 mph (3,200 km/h) at altitude. It was a conventional afterburning turbojet for take-off and acceleration to Mach 2 and then used permanent compressor bleed to the afterburner above Mach 2. The way the engine worked at cruise led it to be described as "acting like a turboramjet". It has also been described as a turboramjet based on incorrect statements describing the turbomachinery as being completely bypassed. The Convair X-6 was a proposed experimental aircraft project to develop and evaluate a nuclear-powered jet aircraft. The project was to use a Convair B-36 bomber as a testbed aircraft, and though one NB-36H was modified during the early stages of the project, the program was canceled before the actual X-6 and its nuclear reactor engines were completed. The X-6 was part of a larger series of programs, costing US$7 billion in all, that ran from 1946 through 1961. Because such an aircraft's range would not have been limited by liquid jet fuel, it was theorized that nuclear-powered strategic bombers would be able to stay airborne for weeks at a time. Nuclear marine propulsion is propulsion of a ship or submarine with heat provided by a nuclear power plant. The power plant heats water to produce steam for a turbine used to turn the ship's propeller through a gearbox or through an electric generator and motor. Naval nuclear propulsion is used specifically within naval warships such as supercarriers. A small number of experimental civil nuclear ships have been built. 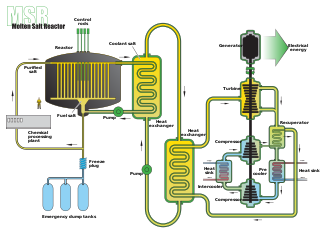 A molten salt reactor (MSR) is a class of nuclear fission reactor in which the primary nuclear reactor coolant and/or the fuel is a molten salt mixture. MSRs offer multiple advantages over conventional nuclear power plants, although for historical reasons, they have not been deployed. The Tupolev Tu-95LAL,, was an experimental aircraft that was a modified Tupolev Tu-95 Soviet bomber aircraft, which flew from 1961 to 1965, analogous to the United States' earlier Convair NB-36H. It was intended to see whether a nuclear reactor could be used to power an aircraft, primarily testing airborne operation of a reactor and shielding for components and crew. A liquid metal cooled nuclear reactor, liquid metal fast reactor or LMFR is an advanced type of nuclear reactor where the primary coolant is a liquid metal. Liquid metal cooled reactors were first adapted for nuclear submarine use but have also been extensively studied for power generation applications. The Molten-Salt Reactor Experiment (MSRE) was an experimental molten salt reactor at the Oak Ridge National Laboratory (ORNL) researching this technology through the 1960s; constructed by 1964, it went critical in 1965 and was operated until 1969. The WS-125 was an American super long-range strategic bomber project during the Cold War to develop a nuclear-powered aircraft, which was scheduled to be designated the B-72. The General Electric J87 was a nuclear-powered turbojet engine designed to power the proposed WS-125 long-range bomber. The program was started in 1955 in conjunction with Convair for a joint engine/airframe proposal for the WS-125. It was one of two nuclear-powered gas turbine projects undertaken by GE, the other one being the X39 project. Project Rover was an American project to develop a nuclear thermal rocket. The program ran at the Los Alamos Scientific Laboratory from 1955 through 1972 and involved the Atomic Energy Commission, and NASA. The project was managed by the Space Nuclear Propulsion Office. The Convair NB-36H was an experimental aircraft that carried a nuclear reactor. It was also known as the "Crusader". It was created for the Aircraft Nuclear Propulsion program, or the ANP, to show the feasibility of a nuclear-powered bomber. Its development ended with the cancellation of the ANP program. A closed-cycle gas turbine is a turbine that uses a gas for the working fluid as part of a closed thermodynamic system. Heat is supplied from an external source. Such recirculating turbines follow the Brayton cycle. The Convair Model 23 was a 1950s design for an American nuclear-powered seaplane for the United States Navy. Like the Air Force's WS-125, the Model 23 never left the drawing board due to risks posed by operations of nuclear-powered aircraft. ↑ Emme, Eugene M, comp (1961), Aeronautics and Astronautics: An American Chronology of Science and Technology in the Exploration of Space, 1915–1960, Washington, DC, pp. 49–63 . ↑ Colon, Raul. "Flying on Nuclear, The American Effort to Built[sic] a Nuclear Powered Bomber". Archived from the original on 2 November 2008. Retrieved 2008-11-05. 1 2 "Megazone". The Decay of the Atomic Powered Aircraft Program. Worcester Polytechnic Institute. 1993. Retrieved 2008-11-05. ↑ "Nuclear Powered Aircraft". Brookings Institution. Archived from the original on 2006-03-02. ↑ "Chris Peters: California Tonalist Painter and Filmmaker". www.atomictourist.com. Retrieved 12 April 2018. ↑ Thornton, G. "Introduction to nuclear propulsion- introduction and background lecture 1, feb. 26-28, 1963". NASA. NASA Technical Reports Server. Retrieved 21 September 2011. ↑ Launius, Roger D. "Aeronautics and Astronautics Chronology 1950-54". www.hq.nasa.gov. Retrieved 12 April 2018. Dreams of Nuclear Flight — The NEPA and ANP programs (PDF), Wisc . Wendt, Gerald (1951), A Scientist Preview The First Atomic Airplane (article) with illustrations on the subject of using an atomic reactor to power an aircraft. Martin, Richard (2012-05-08), "ANP", SuperFuel, pp. 109–12, ISBN 9780230341913 .